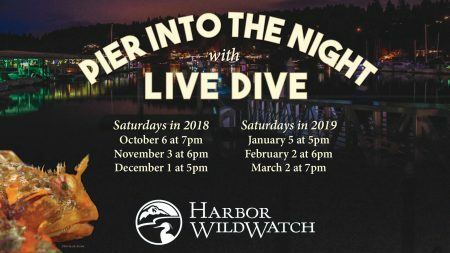 Take an underwater journey of Gig Harbor Bay without getting wet (or needing special certification) through the Pier Into the Night experience! While you stay warm and dry on the dock, our divers use an underwater video camera to live stream exactly what they encounter below the surface. Staff biologists and trained volunteers identify the plants and animals that appear on the 10 ft. screen. Animals we have encountered at past events include: Feather-duster tube worms; red Irish lorde, sculpin, and gunnels; red rock, kelp and graceful crabs; stubby squid; Giant Pacific Octopus, and much more! 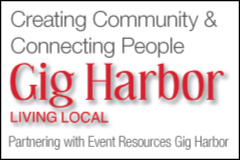 This program takes place on Jerisich Public Dock in Downtown Gig Harbor, rain or shine. Dress for the weather and bring a chair. Suggested donation of $2 per person or $5 per family.